Happy New Year! We’re looking forward to more travel adventures in 2018. Since we’re still plotting out our upcoming summer trip to Asia, we thought we’d share a few of our travel planning strategies again. They apply not only to extended trips but to weeklong vacations and weekend getaways alike. Here are five tips that will help you nail down your itinerary once you’ve settled on a destination — and they just might lead to tweaking that destination a bit, too! 1. Decide on the things you definitely want to do during your trip. Once they’re decided, build your itinerary around them. We love snorkeling and birding, so we definitely built in time to do those activities. We really like to do day hikes, and love national parks, backpacking, and photography. Discovering some of an area’s cultural elements and connecting with locals is always fun, too. Other travellers may savor history, adventure, or local cuisine. Whatever your travel goals are, prioritize your favorite travel experiences when planning for travel to maximize your enjoyment. Traveling with kids? Involving them in the travel planning can really pay off. 2. Think about your budget. While it’s a bit tough to nail down a precise budget well in advance of a long trip, consider whether you want to go low-budget and spend as little as possible, perhaps in the name of extending your trip or saving for the next one; go middle of the road with a few splurges built into your budget; or, if the sky’s the limit, choose all of the destinations and activities you don’t want to miss. Creating a fairly specific travel budget as soon as possible allows you to begin saving for that next trip as soon as possible. And saving each month for an upcoming trip increases the likelihood of making all of the items on that itinerary possible! 3. Talk to other people who’ve traveled to where you’re going. If you’re lucky, people will just start giving you unsolicited advice (and please, leave some for us in the comments if you’ve been to Bali, Sumatra, Myanmar, Kuala Lumpur, or the Perhentian Islands! ), but if not, seek people out. Someone you know probably knows someone who’s been there, and getting first-hand information from people who’ve been there can be really valuable. If nothing else, it will get you excited about your adventures! 4. Read, read, read. 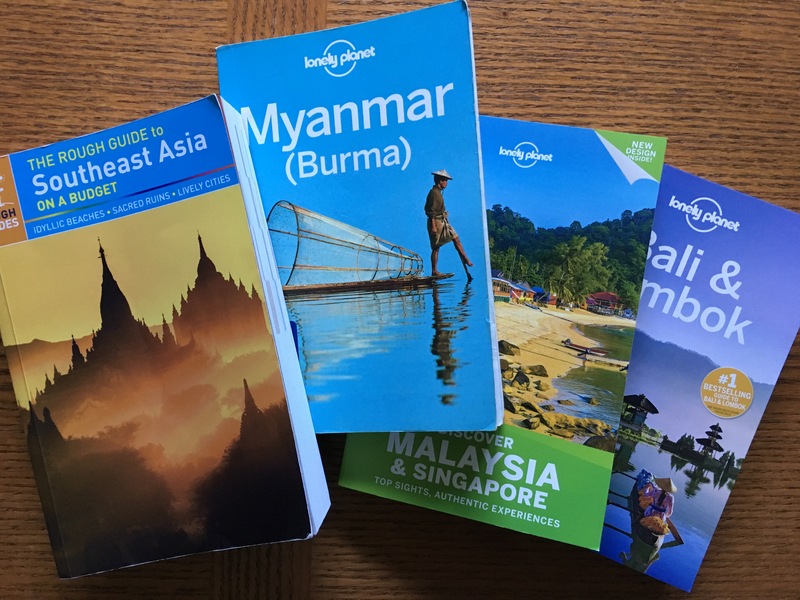 Our trip to Asia is six months away, and our guidebooks are already getting dog-eared. We’ve been burning up the wi-fi doing online reading as well. We’ve read travel blogs, tourism websites, the US Department of State travel website (as well as their Canadian and Kiwi counterparts), the CDC website, and tour operators’ websites. 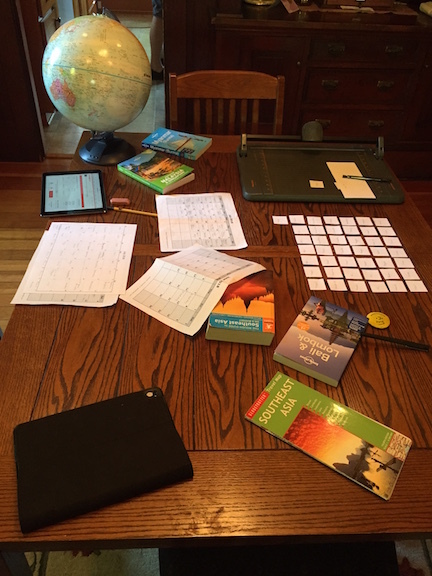 Even if booking a tour is not in your travel future, ideas gleaned from tour operators’ published itineraries can be very helpful for planning independent travel! 5. Keep an open mind. Before we started, we had a pretty firm plan of where we wanted to go in southeast Asia, but due to many, many factors, and after many, many hours of research and discussion, we’ve scrapped a bunch of that original plan in favor of some different destinations. And I’m totally fine with it. In fact, we’re excited about where we’re going, and we know we’re going to have amazing adventures! Do you any travel planning trips to share? Leave us a note in the comments. And enjoy planning for your 2018 travel adventures, whether they’re for a week or a weekend!